We promised we would be back . . . it’s the return of the European summer vacation! Following the attendance breaking indoor arena run that ended in May of this year, we are psyched to announce that we will be returning to Europe in May of next year to do an outdoor run of our own shows, primarily in stadiums, but also the occasional park and even a castle thrown in for good measure! Kicking off May 1, 2019 in Lisbon, Portugal, the tour will visit 25 cities across 20 countries including many cities we did not stop in on the most recent excursion. Milan, Zürich, Dublin, Berlin, Moscow, Warsaw, Bucharest, Göteborg and Brussels (first time since 1988!) are all on the itinerary this summer. We also have three firsts (go figure!) with shows in Trondheim Norway, Hämeenlinna Finland, and Tartu, Estonia. Joining us for the festivities will be Ghost and Bokassa. This tour also marks the appearance of another first in Europe with the Wherever I May Roam Black Ticket, a wildly popular addition to our menu of options for the current North American tour. 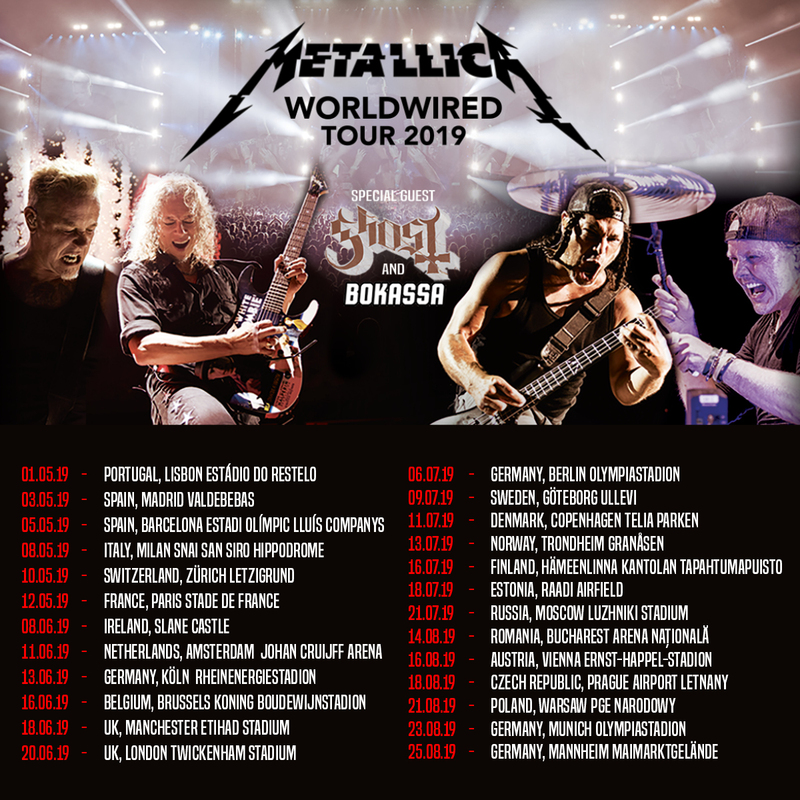 The Black Ticket is your one-stop shop; a single ticket that allows you Golden Circle access to any Metallica show on the 2019 European tour. Pick your city from A(msterdam) to Z(ürich), make a reservation online no less than 48 hours before the gig and you're in! A limited number of 750 of these Black Tickets* will be available for 598 Euro and you can get yours by visiting visit CIDEntertainment.com or by clicking any of the European “Enhanced Experiences” links in the Tour Section of Metallica.com. We’ve got one more cool new thing for you on this tour as each ticket will include a free MP3 download of the show(s) you attended, all mixed by the team behind Hardwired…To Self-Destruct . All you need to do is scan the barcode on your ticket or enter it in on LiveMetallica.com/scan to pick up that free download of the full set. The enhanced experience options have been updated and well, are even more enhanced! We continue to partner with the team that makes it all happen at CID Entertainment to bring you three options, including premium tickets and amenities ranging from early access to the venue and the "Memory Remains" exhibit of memorabilia to meeting some of us(!). For full package details, visit CIDEntertainment.com. Ready to dive in? Presales for Fifth Member Fan Club members begin tomorrow, September 25th at 10:00 AM CEST. For more info on the Fan Club presale, visit the Club News section or click here for a complete list of other presales. Tickets go on sale to the general public on Friday, September 28th at 10:00 AM local time. We're just getting started here in North America and are ready to extend the good times through next summer! * Wherever I May Roam Black Tickets are non-transferable and if re-sold will be revoked. Each ticket is good for entry to Metallica specific shows and may not be used for festivals, promotional shows, benefit concerts or any other dates not included in the 25 city tour announced on September 24, 2018. Use of a Black Ticket will require a reservation for each show you plan to attend no less than 48 hours in advance. More details about how to use your Black Ticket will be sent to purchasers via e-mail. ** Every ticket purchased through official outlets includes your choice of a standard physical or standard digital copy of Hardwired…To Self-Destruct. Fans will receive and e-mail from their ticketing agent with information on how to redeem their albums. Full details on how you can gift the album, should you have already purchased it, will be given on the redemption page.